Asset Based long-term care plans have been around since the late 1980’s but became the fasted growing type of policy after passage of the Pension Protection Act. Asset Based plans allow a person to deposit money into a long-term care plan that will provide them future tax-free long-term care benefits. For every dollar you put into your plan, you will get a multiple of dollars back (up to unlimited) tax-free should you need long-term care. If you never need care or choose to cancel your plan, you can get your initial deposit back, plus interest in many cases. Some plans even offer additional benefits such as tax-free death benefits should you die before using or surrendering your plan. Assets based plans work like the ultimate savings account. The money is guaranteed to grow at a set rate, the clients have access to this money if needed, and if they need long-term care, they will get a multiple of the initial deposit back tax-free. When properly designed, these plans will cost the client nothing and can provide an unlimited amount of long-term care benefits. Husband 74 and Wife 72, make a single deposit of $270,788 into their plan and pay a guaranteed level annual payment of $2,647 for a continuation of benefits rider. This provides each of them a monthly benefit of $8,000 for long term care. This policy will last a minimum of 50 months if both are on claim and drawing out the maximum benefit of $16,000 per month. They may cancel the plan at anytime for the cash surrender value and there is a second to die death benefit of $400,000 that will be paid to their estate if they never use the plan for long-term care. Note: Here is a great example of an alternative to self insuring. Although these clients are well into their 70’s, this plan provides great protection should they need care. This design was chosen for the flexibility this plan provides. The plan is made up of two parts. Part 1: The initial deposit purchased them $400,000 of benefit that is guaranteed to come back to them either as long-term care, death benefit or the cash surrender value. Part 2: The continuation of benefits is a second pool of money that can be used if part one is exhausted for care and is available for a guaranteed level payment of $2,647 per year. This premium will stop once client is on claim. Part 2 can be cancelled at anytime without affecting part one. This gives the clients maximum protection if they need it early on but also allows them flexibility in case one of them passes away and they don’t need the full amount of coverage. The death benefit and cash value growth are guaranteed. 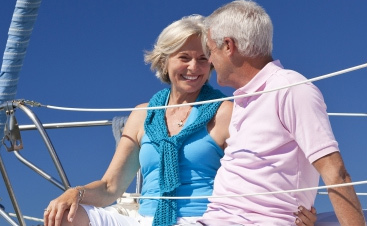 Husband 65 and Wife 62, make a single deposit of $210,000 using retirement funds and pay a guaranteed level premium of $1,292 per year for a continuation of benefits rider. This provides them with a joint policy that can be accessed up to $8,163 per person per month with a total coverage of$816,300 for long-term care. The initial deposit was drawn out of a 401k retirement account and will be taxed over equal installments for 20-years. Note: This plan used qualified funds meaning taxes have not yet been paid on them. The advantage of this plan is they get the immediate long-term care and death benefit that comes from the plan on day one. However, they will be taxed on their withdrawal from the retirement account over 20 years. The funds came from the husband’s account but will create a joint policy so both are covered. This will also count as required minimum distribution when he reaches age 70 ½ meaning he will be forced to withdraw less from his retirement account to meet the RMD requirements. This plan offers many advantages and uses provisions in the Pension Protection Act to provide additional tax advantages. Male 84 makes a single deposit of $100,000 into his plan, this provides an immediate long-term care benefit of $298,845 which can be used over 6 years. The client has access to his cash value and can withdraw up to 10% a year which will simply decrease his long-term care benefit by 10%. If the client passes away, his estate will receive the cash value minus any long-term care benefits paid. Note: Mistakenly, his advisors told this client he was too old for a long-term care plan. He wasn’t. 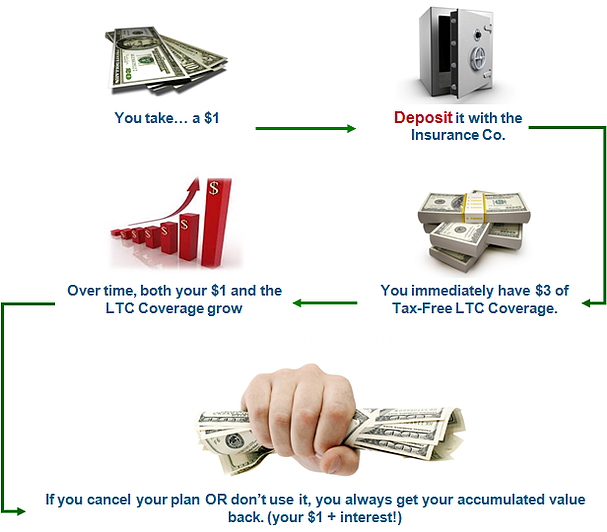 This plan gives the client a simple 3 to 1 leverage on his money should he need care. And all the proceeds come back to him tax-free for that care. To fund this, he used savings that would have been used to pay for care if needed but now he will receive approximately three dollars back for every dollar he put into the plan. 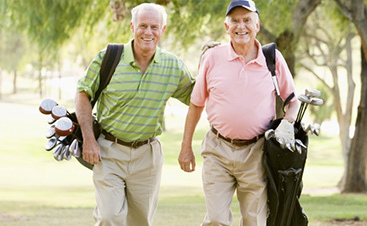 These plans work for individuals up to age 85.